• Home and personal care companies are relatively new entrants to the Fund. • The Amazon onslaught provided a clear opportunity to buy into two industry leaders at depressed prices. • Consumer goods companies are many and varied, but only some are actively investing in the brands which can underpin their continuing success. 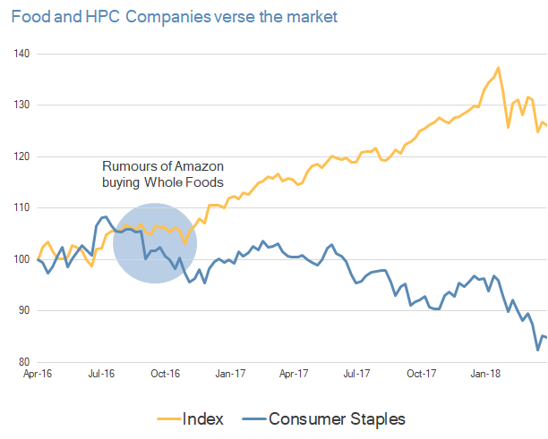 We identified food and home & personal care (HPC) companies as a key research focus in 2017 after Amazon’s $US13.7 billion acquisition of upmarket grocery chain Wholefoods. At the time, the market’s reaction reflected concerns Amazon would disrupt the US retail and digital food landscape – and no brand would be safe. But we saw an opportunity. We intensified our research on the major food and HPC companies and soon came to a different conclusion to the market. We believe global brands are still in demand. Those that can develop an effective and sustainable digital strategy will be able to drive traffic online as well as in store. Many global brands have larger market shares online than they do in store, because online shoppers are time-poor and tend to be more brand conscious. This research led us to initiate positions in two companies: Colgate-Palmolive (Colgate) and Procter & Gamble (P&G). Both companies enjoy strong market shares, driven by management that understand the need to consistently invest in their brands to drive long-term sustainable growth. To test our research and conviction in these names, we attended the Consumer Analyst Group of New York (CAGNY) conference in Boca Raton, Florida. This industry conference is the largest of its kind, run by a not-for-profit group and designed to facilitate robust dialogue among investors, analysts and consumer industry executives. The February event provides management the opportunity to discuss their new products and strategy for the coming year. This year’s conference featured presentations by senior managers from 31 consumer companies, including Colgate and P&G. A key theme was refocusing on investment and innovation to drive top-line growth, alongside the opportunity to drive online sales through targeted digital strategies. This is very much a change from the last couple of years where the focus has been on driving margin improvements through cost savings. Our process tends to de-weight companies with a binary focus on cost saving initiatives. From experience they tend to be unsustainable beyond the short term. Many of the companies at CAGNY have come to the conclusion they were too aggressive in cutting costs as a means of driving sales growth – and now need sustainable investment behind their brands. This was poetically demonstrated when Kraft Heinz — the epitome of this singular focus on margins — released their Q4 earnings results during the conference. (They were not in attendance). The stock was down 27% the day after management cut the dividend and conceded the need to step up spending on their brands to reinvigorate revenue growth. By comparison, the HPC companies we own have been consistent in their approach to brand management and investment. In 2019 they are focusing on the latest innovations and product launches. In 2019 Colgate is embarking on one of the biggest projects in its 200 year history — a relaunch of its bestselling Total toothpaste. The company already holds a dominant market share for its oral health care range across a number of countries, but there is little evidence of complacency when it comes to product development. This new iteration of the classic Colgate product is the result of 10 years of research and development. This depth of reinvestment into what is already a market leader is testament to the value Colgate places on its brand. The financial pay-off comes in the form of improved price control. Developing core products like Colgate Total into a premium category can place HPC companies in a strong position to exercise pricing power and expand margins while still growing sales volumes and consumer loyalty. The new Colgate Total is designed to provide even more benefits to the consumer including relief from sensitivity, stronger enamel and fresher breath. The company’s other categories reflect effective innovation in targeting consumer preferences. Colgate Naturals toothpaste — with ingredients such as lemon, charcoal and even seaweed — address a growing consumer preference for natural ingredients over manufactured alternatives. The Palmolive purifying clay body wash is another example of innovation through using natural ingredients. Addressing growth in emerging markets is another key feature of the company’s growth strategy. 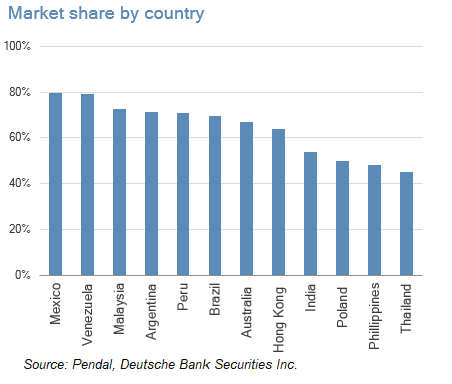 Colgate derives 50% of its sales in emerging markets, with leading positions in the following countries. Colgate achieves this high market share through its price pack architecture which includes products for all income levels. As incomes rise in these markets, consumers can trade up to the higher priced products. Educating customers is of paramount importance for Colgate and offers further opportunity. In Colgate’s markets, 68% of the population brush their teeth less than once per day. Greater education on the importance of brushing morning and night can double consumption. The company’s education programs begin in schools through the Bright Smiles, Bright Futures program, which provides dental care resources to teachers. The program has been in operation since 1991, reaching more than 850 million children in 80 countries. The company has ambitions to reach 1.3 billion by next year. In developed markets they introduced Colgate Magik, a tooth brush that uses augmented reality to teach kids how to brush their teeth. Take a look at the promotional video. Programs like these exhibit the long-term power of capturing and nurturing customer loyalty from a young age — an approach often overlooked by companies. In our view, Colgate stands out for its leading brands and a strong management team willing to operate the company for long term value creation. Similar to Colgate’s management approach, we also apply a long term approach to investing and take the required time to build conviction. We purchased Colgate for the first time in June 2018 when it was trading at a buyout yield (our preferred valuation measure) of 8%. The stock had traded sideways for around five years so the burden of proof for the upside potential was squarely with the company’s management team. We then waited another six months before adding to the initial investment, which was further complicated by short-term impacts from foreign exchange fluctuations, rising commodity input costs and a trucking strike in Brazil which weighed on market sentiment and the stock price. Notwithstanding these externalities, we have confidence in the company’s ability to capitalise on its investments in the brand and deliver above-market growth over the longer term. We made an initial investment in P&G in December 2018 at the time when its share price reached a buyout ratio of 8%. The updates from P&G at CAGNY were particularly insightful and in time may provide a useful case study on the synergies of innovation, operational leverage and ecological awareness. P&G showcased its new waterless soap DS3 Clean brand at CAGNY. 1. Addressing environmental concerns about water use and packaging waste. 2. Reduced emissions through reduced transport costs. 3. Increased customer convenience by shifting the final stage of production to the household. DS3 products are delivered to the customer in solid form and convert into a liquid when exposed to water, allowing for less packaging and easier shipment. DS3 cleaning products include laundry detergent, toilet cleaner, surface cleaner, hand wash and even shampoo and conditioner. Take a look at the DS3 demo. Expansion of the brand will benefit P&G margins because products are priced at a significant premium to the innovative pods product under the Tide brand. Tide pods are a unit dose product designed for convenience and efficiency over the liquid detergent variant. US household penetration of pods grew from 16% in 2016 to 26% in 2018, highlighting the growth opportunity that still exists for this product and also the potential to grow the DS3 brand. The Tide pods product is driving growth in the US laundry category and has allowed P&G to build a greater share of that market (US market share of tide pods is 80%). As customers gravitate towards e-commerce, P&G is looking for innovative packaging solutions that delight the customer – and save costs. The Tide Eco Box liquid laundry detergent pack is one example. It doesn’t require additional boxing for online sales, takes up less space due to the box design and uses less water. In addition to innovation drivers, P&G is undergoing a five-year $US10 billion cost reduction program (2017-2021). Some of the savings will inevitably be reinvested in the business. We believe a proportion will translate to the bottom line. This, combined with the diverse portfolio of products and a focus on innovation, makes P&G an attractive investment. The company is valued on an 8% buyout ratio and is generating substantial free cash flow to support an attractive 5.1% dividend and buyback yield. A key philosophical principle of our investment approach is to only invest in companies that command leading positions in their respective markets and actively invest in their brands. Invariably this is a function of a company’s brand strength and longevity in the market. Attending CAGNY reinforced our belief that companies which are able to consistently reinvest in their brands will drive long-term value creation for shareholders. We see Colgate and P&G as industry leaders with a strong trajectory of sustainable growth ahead. Click here to find out more about the Pendal Concentrated Global Share Fund. The Industrials sector offers many and varied investment opportunities. Read about our Industrials stock picks and developments in the world of robotics. The global technology giants have delivered great returns for investors in recent years. For those that missed out, is now the time to capitulate? Interested in real estate investment with a difference? Paul Gyenge shares his insights into a well-established company in the US that maximises the development and the management premium.